Got a call yesterday via the Maine State Beekeepers Association Swarm Team Hotline: (207) 619-4BEE for a local swarm and went to grab it at dusk with my friend JCF. Thank goodness the homeowners gave us a shout as they had received two bits of bad advice – a local exterminator was going to charge them $350 to spray the bees with poison (dumb idea – see: Why not Kill Them, by prominent beekeeper Cindy Bee – yes, that is her REAL name) and a local beekeeper (who really should know better) wasn’t patient enough to hear them out and find out where the bees really were (hanging off of the house) and only listened to the first few panicked words “the bees are IN my house” (they were not) and sent her to the exterminators. Very lazy way to deal with a “civilian” who is understandably afraid of 20,000 stinging insects on their home. Swarming honey bees are not going to attack anybody, and it is the responsibility of a beekeeper to help walk folks through that. As a matter of fact. part of the EAS Master Beekeeper requirements are “can present this information to the beekeeping and non-beekeeping public in a detailed, accurate, clear and authoritative manner.” and “knowledge and ability to communicate effectively to both beekeepers and public”. Anyway, off my soap box. The swarm was under the eaves of a log-style home (see red circle) and fortunately they had a sturdy ladder on hand, so we didn’t have to drag one over. I am guessing it was around 4 or 5 pounds of our little flying friends – they were very docile. Just sprayed them with a little sugar water and scooped them into the “lucky” swarm box (see the video of it in action from last year). Combined them with a very weak hive in the apiary by putting a sheet of newspaper between two supers and letting them chew through (the top super also had a hole for them to fly, and let the stray bees come in) overnight. 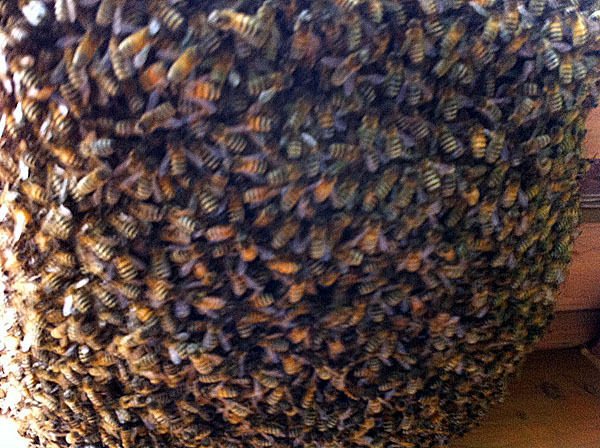 Went to check at lunch today and there was lots of activity around the entrance and lots of happy bees. Will go in tomorrow to check on progress and perhaps even add another super. All-in-all a successful bee rescue.